When visitors of Fota Wildlife Park enter the park, they are usually taken aback at the initial sight of the giraffes in the large paddock. This is more often than not continued by scanning all the other weird and wonderful creatures that share the giraffes’ space including the zebra, oryx, emu, ostrich and many little maras- or as one man coined them “little jack russell dogs”- bobbing about. While standing observing on the other side of the fence, these beautiful animals insight many an awestruck reaction in Fota’s visitors. However, the reaction that is to come next is markedly different and always makes me chuckle inwardly. Some are frozen in confused disbelief, some look with utter amazement and most of the younger folk react by frantically running to get closer to the animals that have somehow defied the rules and gotten the other side of the fence. It is of course our family of 3 free–roaming guanacos and not as people sometimes think, 3 escapees. The guanacos meet such intense interest with a mixture of curiosity, indifference and sometimes defensiveness. They may ward off those that venture too close with a harmless but highly effective spit which is usually loaded with saliva but has in fact the potential to be armed with the contents of their stomach but this to my knowledge has never been necessary from the guanaco’s point of view as us humans run frantically away from their saliva! Onlookers mostly stand and admire these beautiful animals from a respectful distance and wonder at their incredibly soft looking skin all the while wishing they could just once, touch it! People do indeed have an almost instinctual fascination with its softness and urge to reach over and even for just a second, experience how it feels. Guanaco fiber is particularly prized for its soft warm feel and is found in luxury fabric. Like their domestic descendant, the llama, the guanaco is double coated with a coarse guard hair and soft undercoat, which is finer than the best cashmere. While it functions as a luxurious item for us, it is a vital survival tool for them. Their thick coat allows it to survive astonishingly high altitudes of up to 3,962 metres (13,000 feet) above sea level. Not only are they well adapted to the low temperatures but also, the low oxygen levels found high up in the mountains. 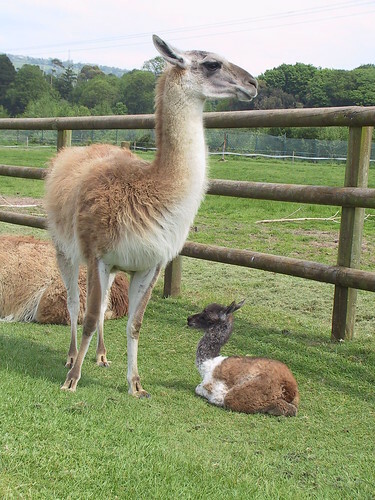 They achieve this with high levels of hemoglobin carrying red blood cells-one teaspoon of guanaco’s blood contains approximately 68 million red blood clells-4 times that of a human! North America some 45 million years ago. The populations that migrated north along the Bering Strait to Africa and Asia can now be recognised as the Bactrian (two-humped) and the Dromedary (one-humped) camel. Those that ventured south through the Panama Isthmus, evolved into the Lamini tribe which is now split into two wild species; the guanaco and vicuña and two domesticated species; the llama (descended from guanaco) and alpaca (descended from vicuña). While wild Bactrian camels are classified as Critically Endangered by the IUCN Red List, both the vicuña and guanaco are at a lower risk status of vulnerable, the latter showing the most stable population of all wild camelids with current numbers at 500,000. 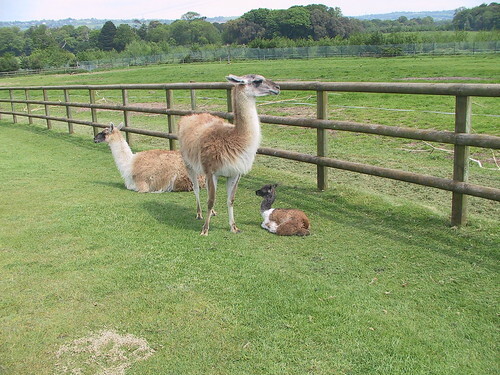 Fota Wildlife Park’s family consists of a 16 year old mother ‘Maya’ and her two off-spring, a son aged 2 years ‘Aztec’ and a newborn calf only 2 months old ‘Inca’!